Happy Thursday friends! This week is complete madness around here. Jeremy graduates from flight school today (hooray!) so we have lots of family in town and lots going on. I'll share more on Sunday with pictures, but today is book chat day! Today, our co-host is Erica from Looking to the Stars. She is pretty awesome and I just love her blog. Go over and say Hi! For today's book chat, we're keeping it simple. Just share what you're currently reading or if you have finished something recently, share a review. As for me...I'm reading two books. This one is a review copy from Netgalley. It's slow moving and at risk of being put on pause. 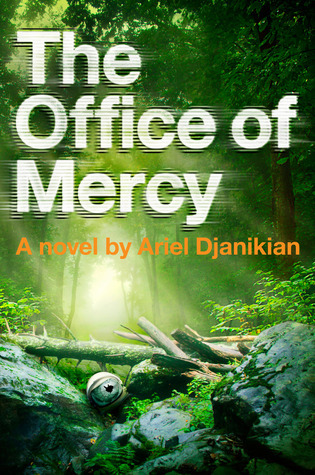 It's an adult dystopian novel, and it's an interesting premise. I just wish the action would pick up a little bit. Full review to come soon. So, last night I had to drive to Atlanta to pick up my mother-in-law from the airport. It was a four hour drive so I got through about half of the book. I was immediately taken away by this story. I am in love with Brashares' writing. There were gasps and tears and shouts. I haven't finished it yet, but I can already say I love it. Daniel is instantly one of my favorite male characters. I have a doozy of a review in the works. What are you currently reading? 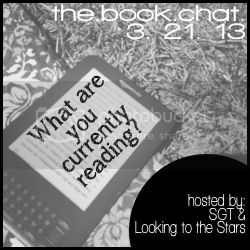 Come book chat with us! I've been debating reading My Name Is Memory. I saw it on sale at a local bookstore last week, but decided not to buy it because I had enough books in my arms (and more than enough on my to-read shelf at home). I'm looking forward to reading your review! 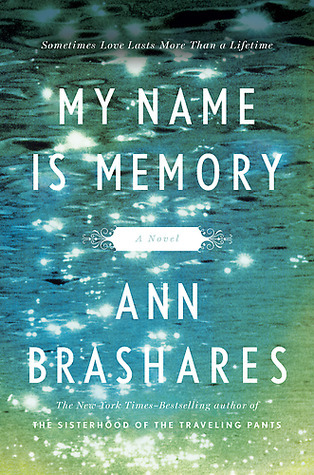 As soon as I saw your Twitter comment about My Name is Memory I added it to my list of books to read. How could I not? It sounds great! I KNEW YOU'D LOVE THAT BOOK! I'm so happy you're finally reading it! I don't remember it as well as I wish I did (I read it in summer 2011) but I've loved every book Brashares has written except a weird phase where she wrote two weird ones. Just based on reading all of the Sisterhood of the Travelling Pants books, I think Brasheres writes really great male characters. Not that the female characters aren't interesting either but something about the men in those books is just endearing to me. I'll have to check out My Name is Memory fo sho. No way- I just checked My Name is Memory out from the library yesterday. I'll be bumping that to the top of my tbr pile. Hope you have a lovely day and a fun time celebrating with family! I haven't heard of either of these before! This is such a great way to find new books!